I have never spent as long thinking about a single glass bottle as I did while attempting to pry any ounce of information out of the internet about this guy. Now, to be fair, I can’t say I normally spend that much time thinking about single glass bottles, but even if I was a renowned glass bottologist, I’m sure this one would still take the cake. This bottle is handmade, cylindrical, and has a patent finish. Basic, visual comparison with the SHA catalogue suggests it is some sort of medicinal, druggists bottle. The base is a molded 2-piece cup bottom, with two seams that extend up the sides of the body to a bit into the finish. The only decoration is an embossed makers mark on the base of an owl sitting on a crescent moon. What really gets my goat about this bottle is not the fact that I was unable to find any solid information on it, but more that its makers mark is so unique, and I was STILL unable to identify this particular vessel. What I was able to identify, however, was the mark. The embossed owl perched upon a crescent moon that reads “TRADEMARK.” Now that’s a way to let people know that a logo is restricted. 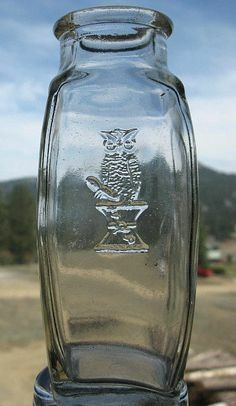 The mark is one that decorates the body of Gillett’s HIGH GRADE Extract bottles, manufactured in the mid-1800’s by the Gillett-Sherer company in Chicago. However, the bottle in question is undoubtedly not high-grade extract, or the same as any of the Gillett bottles I was able to find. Not only is its shape not one used for any Gillett (or Sherer) products the internet has to offer, but it’s basal makers mark is also anomalous! Each moon here reads “TRADEMARK.” I think. After circling around these same photos (and pinterest posts and ebay listings and the seventh circle of antique hell), I turned to the manufacturer for guidance. Which was not given. While I was able to find the street address of the men who started the company, this function of this bottle evaded me. Eventually, I had to give up. My only explanation for this bottle is that it was some sort of test run, proof, or spoof of a Gillett bottle. I can think of no other way for this vessel to be so historically invisible– as a product of the digital age, where all information is available to me at the click of a button, this was particularly frustrating. Still, in some ways I appreciate this mystery. If anything, it is a great example of how, in archaeology, so much time and energy can be poured into artefacts that never give away their secrets. In some ways it is also an exercise in reading between the lines of history: there is a reason we are unable to place this bottle. While this reason may be nothing more than circumstantial, I feel it is still meaningful– which is, to me, the essence of understanding archaeological interpretation. Upon further research the W.T. 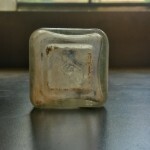 CO U.S.A is a maker’s mark from Whitall Tatum & Co. which was located in Millville, NJ. So it appears this bottle was manufactured there and then utilized by Lee’s Pharmacy. 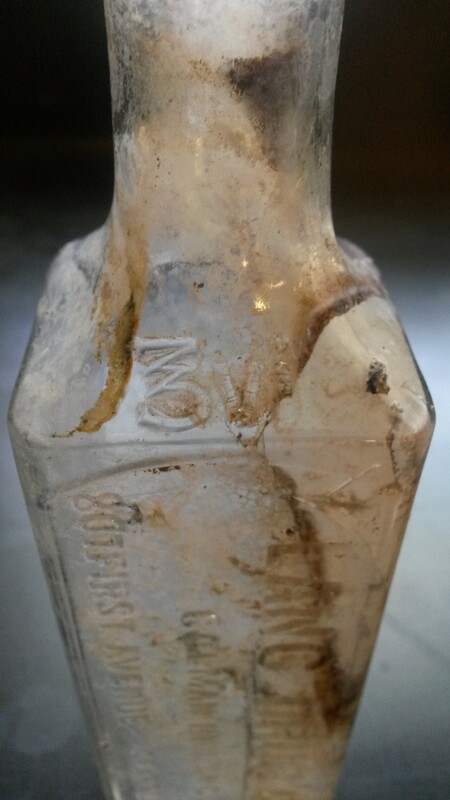 This particular bottle was manufactured sometime between 1901- 1914. Lee’s Pharmacy was located in the historic Alaska Building located in Seattle, WA and stayed in business from 1889-1914. The bottle obviously contained some sort of medicine although it is difficult to say exactly what was inside of it. It is unique to have the building where Lee’s Pharmacy was located embossed right on the bottle as well. The Alaska Building was the tallest building in Seattle at the time it was constructed in the early 1900’s! Needless to say, it’s pretty cool to think about what was going on during this time in Seattle and how Lee’s Pharmacy eventually relocated to the Alaska Building after it was constructed. 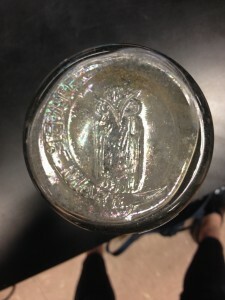 Bottles, Embossing, and (Unidentified) Base Marks– Oh My! Pictured above is a medicinal bottle. The embossed label marks it as a prescription/druggist’s container, and reads: LANG DRUG CO. COLMAN BUILDING, 807 FIRST AVENUE- -SEATTLE WASH. 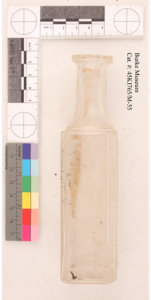 According to the Society for Historical Archaeology, other samples of the same bottle type date to the mid-1880s. Of particular interest are two embossed marks, one on the shoulder and the other on the base. The first consists of a stylized number “3”, followed by the numerals “vi”. This mark is an indicator of measurement belonging to a system known as the apothecaries’ system. 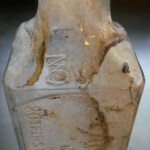 In this case, the stylized “3” stands for ounces, and the “vi” stands for the number six, meaning this particular bottle contained six ounces, or the equivalent of forty-six teaspoons, of some sort of fluid remedy. The second mark features the letter “M” situated within a diamond shape. Though other marks similar to this one (often a different letter located within the diamond) are recognizable as makers’ marks, this particular letter/shape configuration has yet to be attributed to any manufacturer, though one source dates it at around 1890. 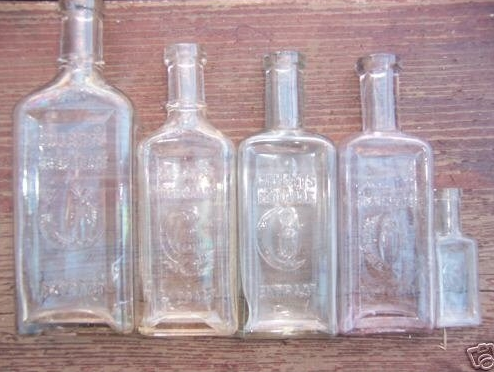 Though information about the Lang Drug Company is scarce, one source highlights the company’s move to 807 First Ave. in 1905; this later date might indicate that the bottle was reused since its manufacturing. 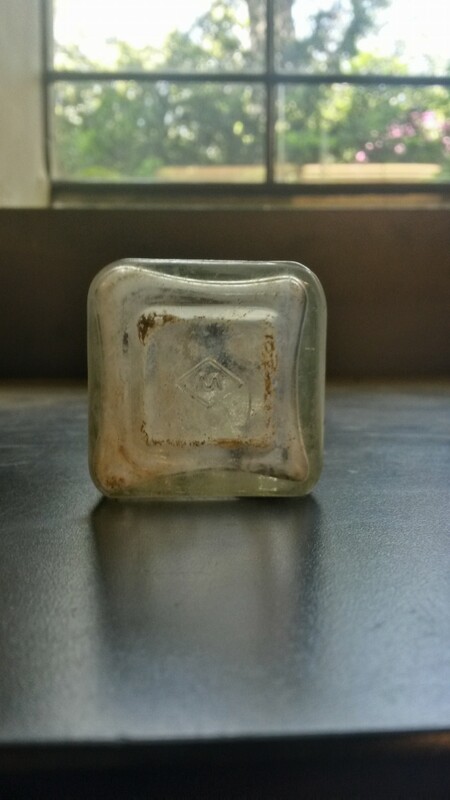 Given the bottle’s type and place of origin, it’s not unreasonable to expect that this artifact was once belonged in the medicine cabinet of a household in Seattle, perhaps near what is today Pike Place Market (with 807 First Ave. located roughly eight blocks southeast). Further analysis of the assemblage as a whole will provide a better picture of the deposition context, and will likely contradict such expectations. In any case, it’s far removed from the context of the lives of women in Five Points, New York, though it might raise similar questions as to the lives and livelihoods of those on the opposite coast.